Marriages are made in Heaven, says an old idiom. Though marriages are conducted in earth, the rituals and customs associated, gives an heavenly aura. Different customs and rituals are prevalent among different communities in India . These distinctively different marriage rituals and customs make an interesting topic for discussion around the world. The big fat Indian wedding is a mesmerizing mix of color, costumes and affection. In western countries, arranged marriages are a tradition of the past . But in India, and other Eastern countries arranged marriages are still a part of the tradition and the parents find a suitable partner for their children. India is a secular nation, which gives freedom for its numerous castes, creeds and tribes to practice their religious faith and customs freely. Every community has their own wedding customs and traditions . The wedding customs of all the communities particularly Punjabis are fabulous. Punjab is a prosperous agricultural state in India with its hardworking populace. Their culture is largely associated with fun and frolic. The Punjabi wedding is popular because of its distinctive style of celebration filled with enthusiasm. People take marriage celebrations as an opportunity to show zest of life and vivaciousness. 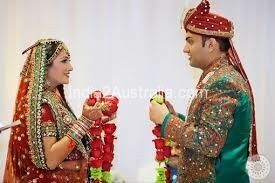 First ceremony of the Punjabi marriage is Roka or saith ceremony. This is the announcement of marriage as soon as a suitable match is found which involves exchange of gifts, sweets, dry fruits etc . After this ceremony the couple stand engaged unofficially. The next step is Sagai. The wedding celebrations start with the Tikka ceremony, generally held 7-10 days before the main wedding. The close family members of the girl visit the boy’s house with gifts and tikka material in a silver tray. A few paddy grains are added and wrapped in colorful papers in a silver tray. In return the boy’s family gives seven kinds of dried fruits in seven baskets: Cashew nuts, Almonds, Coconut pieces, Chuahara, Dried apricots, Raisins, and Phoolmakhana. 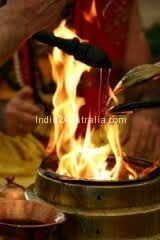 However, at present, the sagai or the tikka ritual is generally performed on the day of engagement. 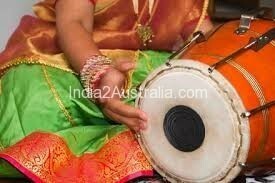 Then comes the ritual of Sangeet, the entertaining program of dance, music and fun. The family members of the girl hosts the Sangeet rituals by playing “dholki”. They invite a few close relative for the ceremony. The boy’s family also hit back by doing another sangeet function hosted by them. Though these traditional customs has now been transformed into live bands. 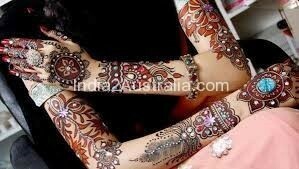 Before the main wedding, the Mehendi ritual is the last major function. The Mehendiwallis come to the houses of both boy and girl to decorate hands and palms of the family members ( female) and the the bride. Now starts the main ceremony with maaiyan. It starts three days before the wedding when the bride remains at home relaxing and doesn’t meet any outsiders, including the groom. On the wedding day morning, a paste of turmeric is applied to the bride’s face, hands and legs for the beautification of skin. After taking bath she wears “chura”, and bangles of red and white ivory . On the groom’s side, the mother of the groom ties the veil of flowers (sehera) on the turban followed by worshiping and praying for his good life ahead. The groom dresses up in the wedding clothes, and the parents and the elders’ ties sehra on the grooms head. 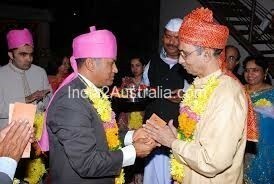 The pink colored turban is worn by him after it is blessed by all the elders present. Then the groom sits on a female horse to set out for bride’s house. The horse will be detained by the sister of the groom to gain bribes from their brother. After they release the horse, the groom starts in galloping pace for the bride’s home. When the barat reaches the venue of the wedding, milni ritual is carried out. The groom is given a warm reception by garlanding and sprinkling rose water. In this ceremony, the girl’s relatives present shagun of cash and clothes to the nearest relatives of the groom in descending order. The bride’s family members greet the groom and his party . Then the bride and groom exchange garlands. The groom is normally taller than the bride. While garlanding, the groom never bends to accept the garland from the bride. This is a symbolism to convey the idea that the bride will be the one to compromise in their conjugal life. The wedding ends with the “pheras.” This is very important in a marriage being an exchange of vows before the holy fire. After that, bride’s father gives away her daughter to the groom. The bride’s father gifts a ring to the groom by wearing it on the groom’s hand. In the past, the bride was exchanged with a donation of cow, but now it is performed by donating money to the priest or pundit. Then the couple go around the sacred fire for 4 times and advance 7 steps towards the north symbolizing advancement in their life. The bride puts her foot on a stone to signify overcoming of any hurdles in their life. The bride’s brother gives sweet to the bride and the bride in turn gives it to the groom. This is also symbolic of the bride’s impossibility of returning to her previous state of girlhood as the sweet can’t go back to its previous state. After the marriage is over the bride leaves her parents house by throwing back a handful of rice at them. This is tearful Vidaai Ceremony. On arriving at the matrimonial home the mother of the boy spills mustard oil on both sides of the door. Then they perform some rites and take the couple inside home. Finally, after 1-2 days an impressive welcome party is thrown by the parents of the groom to welcome the couple in their family.